I really feel for the Arik airlines staff who has had to go on strike in Nigeria for non payment of their salaries for the last 7 months.Can you imagine someone leaving home in Nigeria with all the stress,going to work and not being payed for 7 months?With children to feed,bills to pay,school fees and what not?At times it is nothing short of hell living in Nigeria. 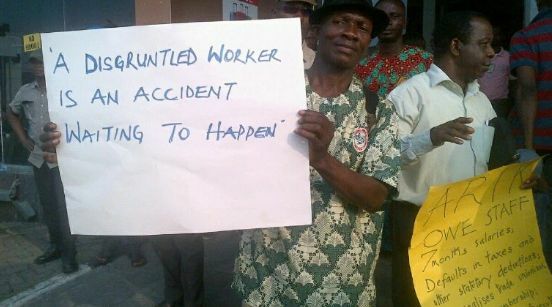 The staff of the airline staged a protest at the domestic terminal of the Murtala Muhammed airport over their arreas and other anti-labour practices. You are owing pilots who 'cruise' people in the sky for several months? The protesters displayed placards containing messages communicating their grievances. The Acting Chairman of ULC, Alhaji Tokunbo Korodo, said in a telephone interview in Lagos that the union could no longer tolerate the inhuman treatment of the airlines management to workers. Korodo said that apart from owing workers for seven months, the management of the airline was not remitting the taxes of workers to relevant bodies. The unionist said that five executive members of the ULC working in Arik had been sacked. He said, “We have shut down Airlines operations, due to non-payment of seven months salary and non- remittance of workers’ taxes to relevant agencies. “The office will remain shut until the end of the year, unless the management reaches a compromise with our union on the anti-labour issues. “We cannot continue to watch Arik management maltreating our members. Enough is enough. Korodo, who is also the South-West Chairman of NUPENG, said that the union had directed tanker drivers to stop supply of aviation fuel to the airline until it resolved the issues. NAN reports that he said the action is not limited to Arik Lagos office, describing it as a nationwide clampdown on Arik Airlines. The National Union of Air Transport Employees, Air Transport Senior Staff Services Association of Nigeria and the National Association of Aircraft Pilots and Engineers had in a joint statement on Monday ordered its members to commence the strike. It is really sad to see that mismanagement in Nigeria has come to be accepted as part of the norm.You see people looking for jobs,they get one eventually,a seriously underpaying one by the way,then they punish the workers by holding their pay for several months.I just cannot understand what my country has become.To think once upon a time,teachers in this country all had cars,civil worker got car loans and everybody was paid on time. Gone are those days because now,things just go from bad to worse in every part of governance in the country.Nigeria we hail thee,arise oh compatriots.